Last week, I shared 3 Ways to Create Style with Plain Hexagon Tile. This week, I play with pattern on this powerful six-sided polygon. Here are three ways patterned hexagon tiles provide a stylish look using both ceramic and cement tiles - all available from Avente Tile. Our journey of creating style with hexagon tiles continues. Hexagon Style Tip #1: Use patterned cement tile in a hexagon format for a subtle design flair. At first glance, the pattern addict would say, "I've seen this pattern. That's not a Hexagon!" But take a closer look, and among the Escher-like tessellations, you'll see the hexagon outline in the grout line. Not only is the pattern playful, so is the tile shape and format; but, in a subtle way that draws attention by making you look twice. If you have trouble seeing the pattern, here's a view of the same tile placed together without any cuts. Patterned hexagon tiles work well in rooms with odd angles or if the walls aren't square. Design trick: Use a patterned hexagon tile for rooms that aren't square or rectangular, badly out of plumb or odd-shaped. The pattern and hexagon shape, when run to the edge of the room, hide all of the problems you'd have when using square or rectangular tile. Hexagon Style Tip #2. Emphasize the hexagon shape with outline patterns. Using cement tile from our Mission patterns, you can show your love for this shapely, equal-sided polygon by using three contrasting or complimentary colors that outline or frame the hexagon shape. Here's an 8-inch format in three colors. Emphasize the hexagon shape with outline patterns like this. The design flexibility of cement tiles means you get to pick the color for a unique design that speaks to you. Consider blue, green and aqua for a bathroom. Choose red, orange and yellow for a bright, warm patio or sunroom, or opt for a more neutral palette, such as the one shown above for a wall. Hexagon Style Tip #3. Create a mosaic with hexagon tile. The flexibility of tile and the geometry of a hexagon work well with creative designs. You can create one-of-a-kind mosaics for the floor or wall using either cement and ceramic tile. Life of Riley by Artist Thimo Pimental is a modular mosaic hexagon cement tile. Colorful hexagon tiles by David Shipley create one-of-a-kind mosaics. Moreover, thanks to the inherit advantages of geometry, patterned hexagon tiles can be create subtle or bold designs, or a playful yet sophisticated mosaic. At Avente Tile, we offer both encaustic cement tile and glazed ceramic tile designs that work on floors and walls, indoors and out. Want to explore more hexagon style and design options? Can't find the hexagon style that you want? Let us know what you need for your project, and we'll schedule a free design consultation to show you how we can help! With it's classic six-sided shape, the hexagon is gaining and maintaining it's elegant prowess in design circles (pun intended) once again. Here are three ways plain hexagon tiles lead to an overall stylish look. Our style guide below uses both ceramic, porcelain, and cement tiles - all available from Avente Tile. Hexagon Style Tip #1. Create a simple pattern with plain hexagon tile in two or three colors. The hexagon format was common in the 1920s. These small-format "penny hexagons" or the penny hex in white was typically used for kitchen and bath floors. It gained some notoriety again in the 1960s, and now, it is once again is a design staple that provides interest without being over-used. Penny-sized hexagon tiles, popular in the 1920s, were typically used as flooring in the kitchen and bath. A simple repeating pattern in black and white works great with hexagon tiles. Stylistic floral patterns and simple borders can also be used with this fun, interlocking shape. Hexagon Style Tip #2. Use hexagon tile with hand-painted glazes or cement tile in the same color. Sound boring? Not really, use an interesting glaze that exhibits variation from tile to tile. Or, use hand-painted glazes or cement tile to achieve the look you're after. The natural variation in color provides an absolutely stunning look that hides dirt, provides a sense of texture or depth, and lots of interest. It's also a more straight-forward design approach for the DIY group. Arabesque Hexagon Spanish Pavers in Cotto Dark, all in the same color, can create a rustic look similar to this. 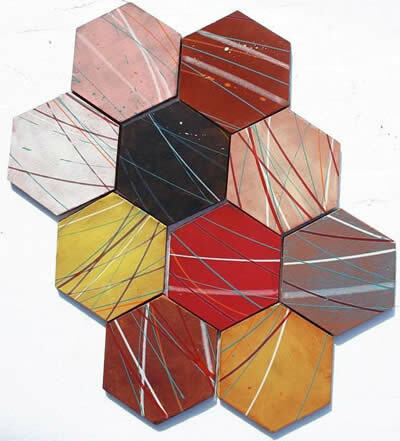 Hexagon tile looks great with hand-painted glazes. 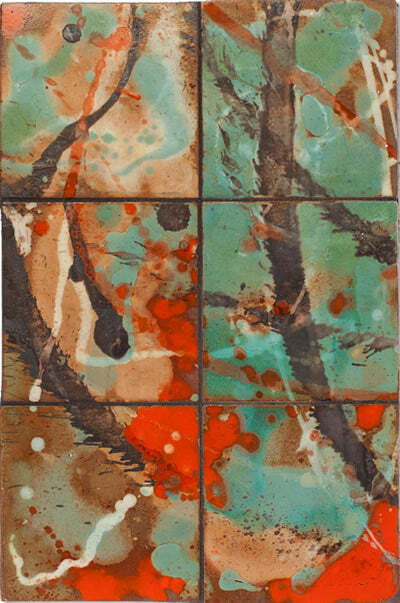 The variation of hand-applied glazes create a look that exudes depth, texture and interest. Hexagon Saltillo tiles provide rustic charm with the natural color variations found in terracotta. Hexagon Style Tip #3. 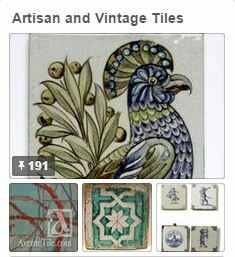 Blend ceramic tile glaze colors or cement tile colors and texture to unique, one-of-kind designs. Feeling creative? Like to work with colors? Then this option is perfect for you. Create a colorful mosaic of hexagon tiles using three to five colors, then choose a size to accommodate the scale of the space. It's easy to see why this classic shape never falls from grace. Hexagon tile, or hex tiles, are just a great way to add both style and grace to any design. Next week get's really fun! I'll show you three ways to create style with patterned hexagon tile. Patterned hexagon tiles can be very playful - the hexagon pattern can almost disappear or form truly unique modular mosaic patterns. If you haven't seen patterned hexagon tile at play, I think you'll be surprised! 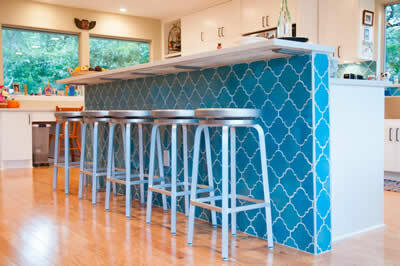 Vibrant blue Arabesque tile adds visual interest. Image via Modernize. Tile is a popular choice for kitchen floors and backsplashes, so popular that even the priciest and most custom options can seem bland. One tile company is changing that, one beautifully unique tile at a time. One thing you'll never find at Avente Tile is tile that looks like, well, any other tile you've seen at home improvement stores or most flooring and tile warehouses when seeking inspiration for your kitchen remodel. Avente specializes in handcrafted tiles that are guaranteed to make your floors or backsplashes stand out from the subway tile and stone tile crowd. If you've never heard of handmade cement tiles, you will. Though they haven't gained widespread popularity in the U.S. yet, handmade cement tiles are used the world over for their bright, true colors and their intricate hand-painted designs. One of the most popular uses for cement tiles is the creation of "rugs" on floors by strategically laying coordinating tiles in a pattern that mimics Persian or other rugs. Perfect for kitchens, where fiber or synthetic rugs can be a hazard, a tile "rug" gives bold color and visual interest while remaining durable and easy to clean. The wide range of colors are perfect for adding a pop of color to an accent area of a kitchen floor, or for inspiring your remodel to new heights of glamour. Relief tiles add depth and dimension to this kitchen's backsplash. Image via Modernize. 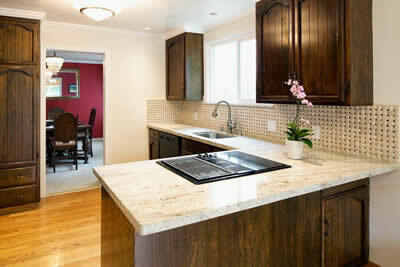 As tiled backsplashes become an integral part of any kitchen remodel, so do the options for backsplash-ready tiles. You've no doubt seen glass, stone, and even pebble backsplashes, but you've likely seen nothing as classically beautiful as hand-painted relief tile. Marrying the lovely forms of sculpture to lightweight tiles, relief tiles are perfect for mixing with other ceramic tiles to create unforgettable backsplashes that are one of a kind. These tiles are the perfect inspiration for traditional, retro or transitional kitchens, but proceed with caution -- the designs are so alluring that they run the risk of taking your kitchen remodel in a whole new direction. 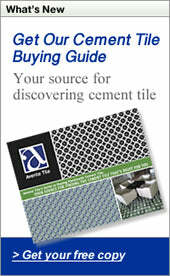 For more tile tips and tricks, please visit Modernize.com. Nothing adds more curb appeal, sense of personal style, and a real design punch than using decorative tiles on stair risers. Decorative tiles used on stair risers showcase personal style and add curb appeal. Tiles allow you to showcase your sense of style. However, most customers approach the use of tiled stair risers with caution. After finding a tile or two they love, I am used to being asked, "Can I do that?" or "Will that look OK?" Rule #1: There are no rules when it comes to tiling stair risers. To prove that point, I'm dedicating this post to the many different ways you can tile stair risers, I'll show the most common ways tiles are used; but,, you'll also see many variations on a theme. You can choose to use the same bright, bold pattern on each row, alternate patterns on each rows, or only add an occasional decorative tile between plain tiles on each riser, With countless variations on these themes, they can all look good! Stair risers tiled with different tile patterns on each step. Rule #2: Start with tiles you love! The right colors are more important than a specific pattern. Just find a pattern that speaks to you or works with your home's style. Colors that contrast with the landscape will make the tiles really standout, such as the bright yellow tiles in the photo above. You can also use colors that complement the house or trim color. Remember, if working with your home's existing colors, the tile colors don't have to be a perfect match - just close. It's common to find tile patterns, like our Malibu ceramic tiles, that are available in one or more different colorways. For larger projects, the glaze color placement can be customized. The same bright tile pattern is used on each riser of these stairs. A hand-painted tile border pattern is repeated on each stair riser. Quarter-design patterns can be used to add geometric interest to the design. Similarly, geometric patterns, border patterns, and Spanish tile patterns can work well with many different styles of architecture. I love how quarter-design patterns can be broken up to create additional interest and their own unique pattern. In the photo above, the quarter-design pattern on the decorative tiles would create a square when placed together on a wall. However, the home owner spaced them differently to create a fun zig-zag or chevron as you go up the steps. If you are "tile crazy" like I am, finding the right tile isn't the problem. The problem is finding too many tiles you love, which might force you to narrow your selection, or does it? In the image below, an assortment of tiles is used to create a repeating pattern on each stair riser. Alternatively, the pattern on each riser could be random. This method works well for wide stairs. Finally, keep in mind that decorative tiles don't have to span the entire width of the riser. While the effect is usually less dramatic, it looks nice especially when the decorative tile on the riser is also used as an inset among the pavers. Different tiles can be used on the same stair riser. Decorative patterned tile don't have to span the entire riser. So far, I've only shown you examples of glazed decorative ceramic tile, which is certainly more common. However, cement tile can be used for stair risers, too. Because the colors in cement tile can be easily changed, cement tile is a fine choice when you want to create a unique design, coordinate colors with the tread, or carry the design from the curb to the home. The tight grout line can also be used to create a very smooth, almost seamless look to the riser, as well. Cement tile colors can be customized so the risers match or coordinate with the tread. An encaustic cement tile border pattern looks magnificent on these stair risers. Regardless of the tile or design there is one very important thing to remember. Rule #3: Have fun! Choosing tiles for your stair risers should be fun and reflect your taste and style. Whether you need a Geometric pattern, want to define a Traditional Spanish or Portuguese look, or have a home that demands Spanish Revival, Avente has the stair riser tile (and tread) for you! If you need help finding the right pattern, ceramic tile design, or cement tile border, please let us know. We can help. Southern California artist David Shipley has created a line of contemporary hand-painted ceramic art tile based upon his unique paintings and sculptures. According to the artist, he is fascinated by the emotions and reactions brought upon by the vibrant color contrasts. Upon reflection of his painting technique and inspiration, Shipley says, "I maintain an ongoing inner dialog, a constant kaleidoscope of Conversations, using colors and shapes which unfold in a variety of constantly changing images. Their manifestations range from joyous and vibrant to dark and disturbing; but for me they also reflect myriad life experiences as I explore the many Conversations we experience with God, ourselves and the people around us." 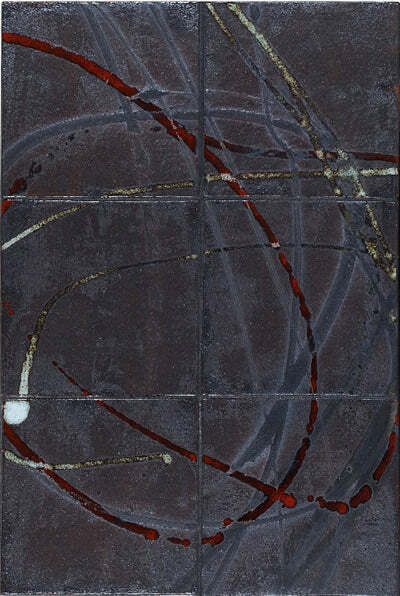 With their stylish, abstract designs, the Conversation Series of decorative hand-painted ceramic tiles are high fired. As a result of this firing, they can be used indoors or outdoors, in freeze/thaw conditions, walls, floors, and wet areas, such as pools, fountains and ponds. Further, the Conversation Series of hand-painted ceramic tiles can be used as a continuous mural or as individual pieces for creating a truly unique mosaic focal point. Each piece can be perfectly paired with our hand-painted ceramic Malibu Field Tiles and Ceramic Trims and Moldings. The solid-colored, high-fired Malibu Field tiles, created using classic red bisque, are offered in several sizes, including: 3"x3", 6"x6", 4"x4", 4"x5", 6"x6" and 4" hexagon sizes. A full line of trim and molding is also available. These tiles are made-to-order. Therefore, please allow four weeks for delivery. Similar to art work, the contemporary tile patterns of the Conversation Series is made to order for a truly custom look and feel. Therefore, the 6- and 4-inch formats, as well as the six-piece ceramic tile mural, will ship approximately one week after your order is placed. Lastly, visit our dedicated Ceramic Tile FAQs page for any questions you may have. Of course, you can also call our office at 888.739.4972, and we would be more than happy to help with your purchasing decisions. Creativity, art and geometrical shapes seem to go hand-in-hand. In this instance, instead of a pulled canvas, ceramic tile is the recipient of an artisan s brush stroke or hand-sculpted designs. For centuries, artisans have manipulated earthly components to reflect their will, inner feelings, or the world around them. From linear sketches to curvaceous renditions, art and ceramic have flaunted their symbiotic relationship through their timeless appeal. Happily, these art works are enjoying a renaissance within the design world, too. Moreover, despite ever-evolving trends, our tiles remain in vogue. In addition to the new David Shipley collection, we invite you to consider our Geometric Cement tiles, Arabesque Cement tiles, and Geometric Ceramic tiles. Want to see more? Or, perhaps we should say "hear more" because of this month's featured tile murals? Get the Conversation going! Hear and see all seven of David Shipley's Conversations. These tiles are all about allowing you to make a statement. We show them in the standard mural format, but they can be mixed-and-matched to make a unique mosaic. What are you waiting for? Get talking!